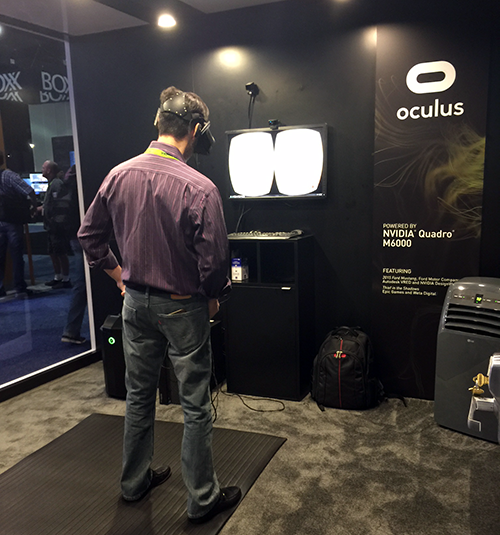 At SIGGRAPH 2015, one observation was inarguable: VR was everywhere. New to the program this year was VR Village, an expo featuring 65 curated VR experiences. We were happy to demonstrate our Unreal Engine 4-powered Showdown demo during the first two days of VR Village. One of the key developers of Showdown is our lead VR engineer Nick Whiting, who was at the conference to speak at our educational workshop and to participate in our production session, "Designing Epic Experiences." Nick did an interview with Denise Quesnel, co-chair of VR Village, which is transcribed below. You can read the full interview on the SIGGRAPH blog. Tell us what you are sharing in the VR Village and any surprising details you might wish to share about it. Also- what inspired you to create your work? Nick: We're showing off a piece that we call Showdown, which was originally created to test the limits of what we could pull off at modern VR resolutions and framerates. The demo was originally conceived to debut Oculus's Crescent Bay headset and NVIDIA's GTX 980. It throws you into the middle of a battle in the streets between soldiers and a giant mechanical opponent, complete with all of the requisite explosions and actions you would expect. While we were largely focused on pushing the technological limits for the demo, we were actually creatively constrained. We only had about five weeks from start to finish to pull off the demo, with a content team of two, and a little bit of borrowed time from others. This meant that we had to adapt content from other demos that we had made previously, namely Samaritan and Infiltrator. We also had limited animation, which meant that we had to take about seven seconds worth of actual content, and stretch it to fill the two-minute demo time. So, we did the most obvious thing, and slowed down all the content to make seven seconds last for two minutes! The result is a happy discovery, born of practical limitations: by slowing down the action all around you, we're able to accentuate the details of the scene. It's really easy to get immersed in it, because there are so many interesting interactions happening at all times around you. You can watch Showdown multiple times, and see new things each time, depending on where you're looking. I must have seen it hundreds of times, but I still notice little surprises every once in a while! How did you become involved in virtual and immersive realities? Nick: I got into VR through a series of happy coincidences which have eventually turned something that was initially a curiosity into something that's much more than that. My first experience with VR was when my friend Nate sent me an Oculus DK1 kit to try out, and eventually to hook up to Unreal Engine. From there, I was hooked! I worked after-hours on an integration with UE4, which eventually led to a tech demo, Elemental VR, which Oculus used to show off their first HD prototype. From there, VR slowly started making in-roads at Epic. One of the real turning points was when our executives visited Valve to see one of their room-scale prototypes. Seeing that prototype immediately showed off the potential of consumer-level VR, and after that, things moved quickly! I now have a team of engineers focused on VR applications, and we're working with amazing partners on new experiences, both in games, as well as other areas that we previously had little exposure to. It's really broadened our business. What do you find is the most exciting development in virtual and immersive realities to date? Nick: The fact that VR has come down to the consumer level in terms of price and complexity is truly exciting to me. Previously, VR was mostly for academic and military applications, because of the complexity and cost. But now, anyone with one of these devices and a computer can grab an engine like UE4, and make an incredible experience for it. There are lots of unsolved problems out there in terms of establishing the grammar of the medium, and it's great to see so many people fearlessly attacking the problems, and sharing their findings. There's really a grassroots community feel around VR these days when you talk to people. Everyone wants to see VR succeed, and so they're very willing to share what they've learned to help others build upon their work and be successful. So what is your favorite immersive experience to date? Nick: I'm a huge fan of anything that lets you share a virtual space with another participant. The first time I experienced a social VR experience was when I was working on another one of our UE4 tech demos, called Couch Knights. The premise is that you and a friend are sitting in an apartment, playing with toys that have come to life. One of the big features we wanted to have was to be able to use the tracking data from the head mounted display, and map that motion on to the character in the world, so you could see the other player move around. I had been hooking the system up to do that late one night, when Nick Donaldson, the designer on the project, wanted some help with the gameplay involving the toys. So, I stopped what I was doing with the character motion, and jumped in a multiplayer match with him. While we were playing, I noticed at one point that Nick's avatar was actually learning forward, and that the system I was in the middle of hooking up was, in fact, actually working. I just sat there watching his character move around, and he eventually noticed me. He nodded, as if to say "what's up?" and that was a simple, but truly magical moment. As humans, we're tuned to recognize the motions and mannerisms of other humans. That was the first time I had truly recognized another human presence in VR, and as primitive as it was, it remains one of the most magical moments I've experienced in VR. Apart from the launch of the VR Village, what are you most looking forward to at SIGGRAPH 2015? Nick: I'm particularly looking forward to peeking outside my usual circle of game development, and seeing what the rest of the world is up to. Technology is all about the convergence of solutions of different areas. Many of the problems we face have addressed or solved outside of our fields. Sometimes all it takes is stepping outside of your comfort zone, and you get an entirely new perspective on how to approach your problem. Just walking around, talking to people that I wouldn't normally talk to, and checking out what they're up to. That's what's most exciting and inspiring to me. Another VR demo making a special appearance at SIGGRAPH was Thief in the Shadows, based on The Hobbit films. Our team collaborated with Weta Digital to create the cinematic UE4-powered experience for reveal at GDC earlier this year. 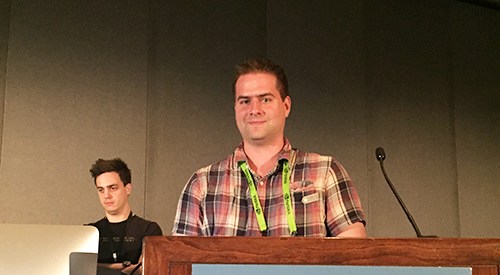 Weta's Alasdair Coull and Dan Smith were a highlight of our "Designing Epic Experiences" SIGGRAPH production session, and as pictured below, Thief was shown in NVIDIA's booth. Looking to catch up with us at future VR events? A few of our upcoming stops include the following. Feel free to sound off with any feedback in the comments section, and stop by our VR forums for discussions with other developers. We're interested to hear about what you're creating and how we can help.